In 1932, Jünger published what is still seen as his most important philosophical work: Der Arbeiter (The Worker ), which outlined the type of civilization he imagined for the future (more on this later). It was also during this year that he published his last nationalist writings, adopting an apolitical attitude from that point forward. 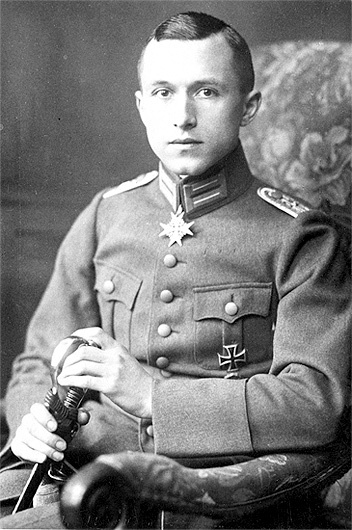 The question that is probably in the minds of many Counter-Currents readers is, was Jünger still a man of the Right after 1932? There is no easy answer. Julius Evola, who praised Jünger’s Weimar-era work and published a book on The Worker in 1960, nevertheless regarded Jünger as a traitor for going back on his oath of loyalty by participating (however peripherally) in the plot against Hitler in 1944, and saw him as selling out to the liberal values of the new Republic in the post-war years. As for the second, I think it is unjustified. While Jünger clearly softened in his later years (he would refer to his early works as his “Old Testament” – but he never disavowed any of them), it is clear to see even in his post-war writings that he was far from a liberal democrat. Jünger always remained an elitist who sought to stand apart from the crowd, and expressed horror at the dehumanizing effects of the ever-accelerating modern world (as he had predicted in The Worker). In his later decades, if anything, Jünger could be fairly described as an anarchist – not of the form one associates with the antifa and street demonstrations, but rather in believing that the modern state has become a prison for the individual, and that only by standing aloof from it and living on one’s own terms, and according to values of one’s own making, can one hope to attain any genuine freedom in a world dominated by bureaucrats with incredible and unprecedented forces at their disposal. It would be impossible to summarize all of Jünger’s literary work in an essay of this size, but there are three works which seem to epitomize the archetypal periods of his thought. The first is The Worker from 1932, which marked the culmination of his nationalist period. He did not use the concept of “the Worker” in a Marxist, classist sense, but rather as an archetype: the Worker is man engaged in any sort of productive or creative endeavor. Jünger believed that the industrial processes which had shaped and supported the impersonal killing fields of the First World War were soon to be implemented across the world, in all fields, and that the individual was doomed to be swallowed up in the processes of collectivization. For Jünger, this would be a world dominated entirely by impersonal forces in which all traditional values would be destroyed in favor of the value of material goods: mass production and consumption. In short, it would be a world made up of nothing but numbers. However, Jünger did see a possible upside to this disturbing vision: he also predicted the rise of a new race of Worker-Titans, Faustian men who would use these new powers as a means of achieving superhuman aims. Humanity as we know it would be destroyed, but the Titans of the future might give rise to something new and more powerful, attaining god-like status.